This was the first trip I have taken in my life that I was not ready to leave and return home at the end. The trip was profoundly heart and soul filling, very healing. I highly recommend the 7-day river trip; it provided the gift of time to see and experience so many beautiful and sacred places of the Grand Canyon, from the little Colorado to the waterfalls and the slot canyons. The guides each bring their own personality, experiences, stories, and knowledge of the Grand Canyon to a trip, making it all that richer in what you see and learn; the guides go above and beyond at Western River Expeditions. There is a peacefulness and a sense of wholeness being on the river in the Grand Canyon gives that I have yet to find elsewhere on the Earth. I am deeply grateful for the moments and experiences I had on this trip and the wonderful people I met along the way; I will carry the memories with me closely. 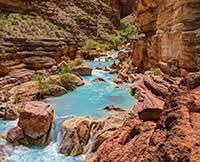 I highly recommend Western River Expeditions and encourage others to support our park services in protecting the Grand Canyon.